Newly disclosed official analysis has revealed that over two million households will experience increased noise under plans to build a third runway at Heathrow. Data released by the Department for Transport (DfT) under the Freedom of Information Act reveals that 972,572 households (approximately 2.2 million people) will experience increased daytime noise in the ‘forecast year’, while 673,784 will experience reduced noise, meaning a negative impact on around 300,000 households. The Guardian reported that these figures relate to 2050, although the document does not state this explicitly. If built, the new runway would open in around 2025 and reach full capacity by 2030, with new planes expected to continue to be quieter on take-off and landing. The data was not included in a noise disturbance analysis attached to the DfT’s Airports National Policy Statement, which has led some anti-expansion campaigners to accuse ministers of burying it. However, the new data includes people experiencing lower levels of noise, who are likely to be those further away from the airport. The DfT has conceded that adverse effects on health and quality of life can be detected at above 51dB LAeq. The DfT pointed out that the new data includes everyone that will experience any change in noise level, including those below 51dB LAeq. 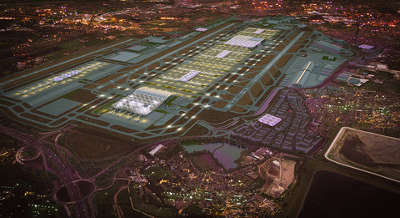 A spokesperson said: ‘We have been clear that expansion at Heathrow would not be allowed to proceed without a world-class package of compensation and mitigation measures for local communities. This includes noise insulation for homes and community buildings and a community compensation fund worth up to £50m per year. The DfT said it still expects to publish and lay before Parliament any final National Policy Statement in the first half of this year.